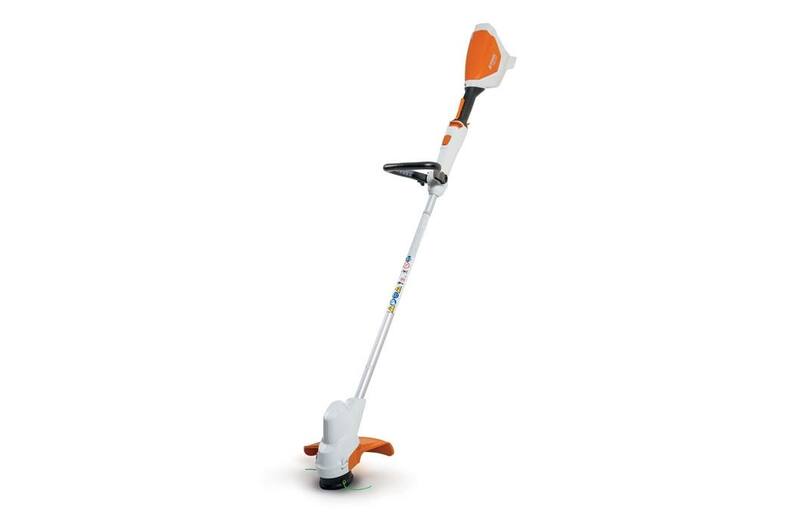 A lightweight and easy to use battery-powered trimmer - ideal for suburban yards. Batteries and chargers can be purchased separately or as a combined set with tool. Get great value with the STIHL FSA 57 Lithium-Ion trimmer. A lightweight, battery-powered trimmer, is an ideal choice for maintaining suburban yards. This trimmer cuts an 11" swath at a continuous high speed, saving time and doing more with a STIHL AK Series battery. With an AK 10 battery, the trimmer weighs just 7.5 pounds and has a run time of up to 20 minutes on a single charge. For comfort and convenience, this unit features an adjustable shaft to customize height to the user, an easy-to-use AutoCut® head which feeds noise-reducing line, and a bump guard to help the user trim carefully around obstacles like trees and shrubs. The FSA 57 trimmer is available as a stand-alone unit or as a value-priced bundle with the AK 10 battery and AL 101 battery charger. Other battery options are available. *Run time may vary based on battery type, charge level and capacity, model, operating style and conditions.